USA Today recently had a story on its front page that claimed home values will take decades to recover if you bought during the peak between 2002 and 2006. According to the article, home values in the United States have tumbled an average of 19% from their peak. And, home prices would need to fall as least 17% more to reach their traditional relationship to household income. Some indicators that the article discusses…. Income. The house price should not exceed three times your average household income, which was true from 1950 to 2000. In 2006 the average household income was $66,600, so the average home price should have been about $200,000. But during that year the average home price was about $300,000. Rent. Traditionally homes sold for about 20 times what it would cost to rent the home. In 2006, that number jumped to 32 times. Until prices fall back to the 20 times number we won’t see stabilization of home prices. Appreciation. Between 1950 and 2000, the normal increase in home value was less than 0.5% per year after adjusting for inflation. From 2000 to 2006, home prices rose at an average annualized rate of 8.2% above inflation and peaked at 12.3% in 2005. Down Payment. In 1989, the average down payment for first-time home buyers was 10%, reports the National Association of Realtors. In 2007, the average down payment for a new home was 2%. Verification of Income. 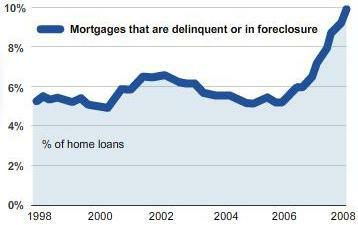 Half of mortgages generated in 2006 required no or minimal documentation of household income. That is now a thing of the past. Optional Payments. 29% of new mortgages in 2006 allowed borrowers to pay interest only or pay less than the interest due and add the cost to the principal. This too has gone the way of the dodo. Housing prices began to fall in 2006. Unfortunately for those who bought near the peak of the bubble, they may never recover their loss. Bubbles drive prices to a point that cannot be matched. This bubble was inflated by easy terms for mortgages through optional payment mortgages, no verification of income, and small down payments.